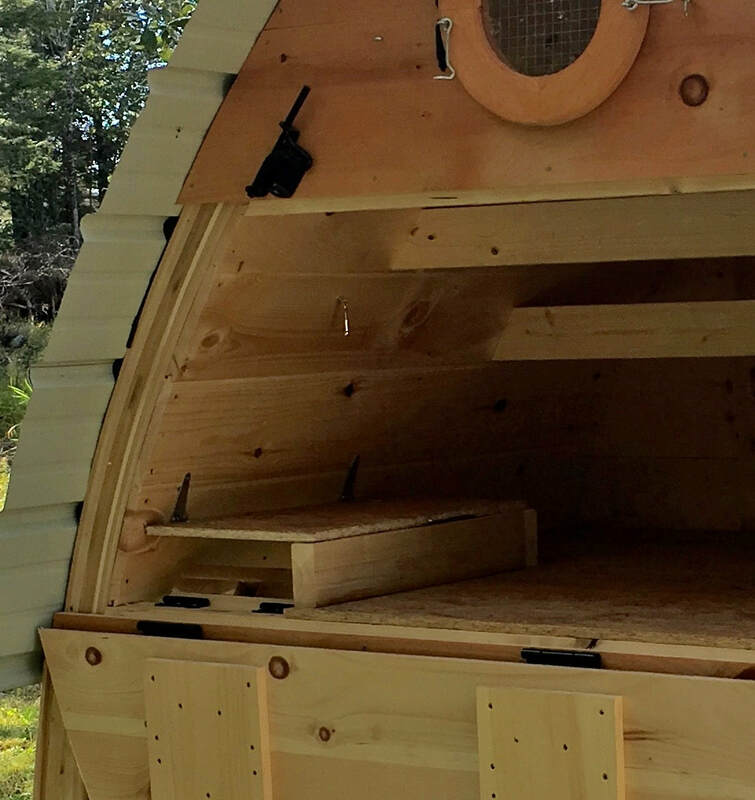 Designed by a Maine artisan and poultry enthusiast, Champion Coops are built specifically for our harsh New England climate, are designed for ease of use and accessibility, and will provide a safe and secure home for your flock. Champion Coops are designed first and foremost for ease of use. The enclosed coop is designed so the doors are at an ergonomically friendly height to minimize bending or stooping when collecting eggs, cleaning, or doing any other chicken chores. An optional heavy duty vinyl floor liner further simplifies coop cleaning. 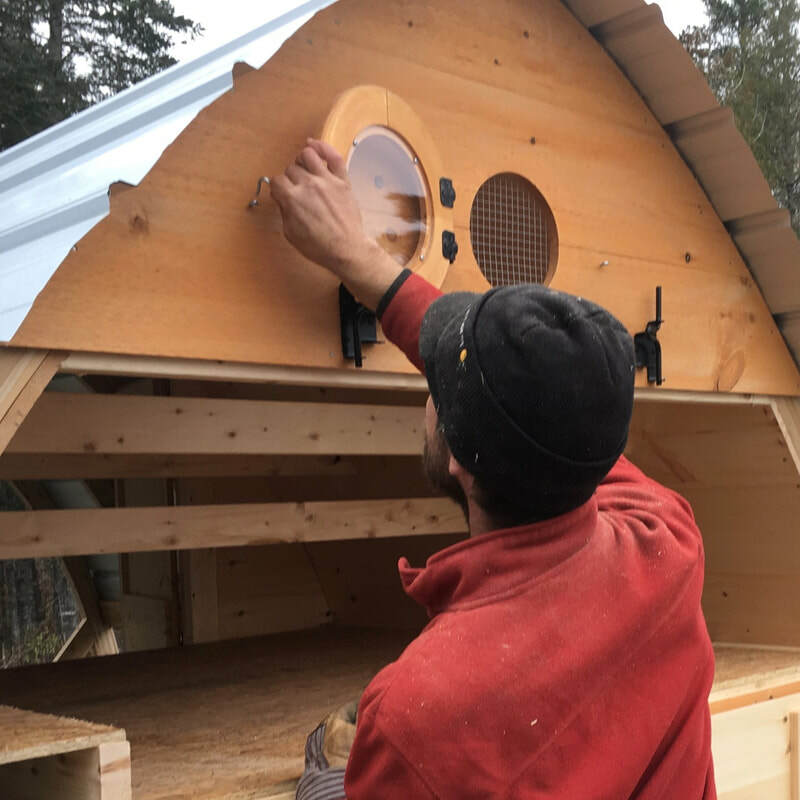 Easily access the interior of the coop and nest boxes through either of the large doors: the cleanout hatch on the back side or the hinged door on the run side. Safely keeping chickens in our neck of the woods requires more from a coop than what most options on the market offer. *PLEASE NOTE: Most companies selling coops will use an "industry standard" of 2 square feet per bird for housing and 4 s.f. per bird for run space. The spacing recommendations we give are based on about 4 s.f. per bird of coop space plus 8 s.f. per bird for run space, giving a total of about 12 s.f. per bird. (based on standard breed sizes, ex/Rhode Island Reds), which is what we personally adhere to with our own chickens and confidently recommend to our customers. So if you're comparing us to other coops, use the "Industry Standard" range given above for an accurate comparison. Our family business operates out of a small facility where the focus is on quality rather than quantity, so it is a good idea to plan ahead for your coop needs. Please contact us for our currently available inventory.